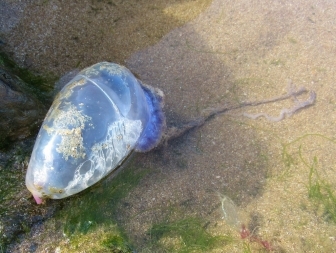 In early September 2017, reports of Portuguese Men o'War off the coast of England and Wales began to appear. 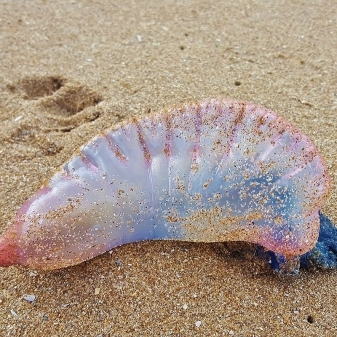 While Portuguese Men o' War are rare in our waters, there are usually a few washed up each year but this year was different, they began washing up in huge numbers. In early September, for example, Perranporth Beach in Cornwall was closed because of safety concerns after hundreds of Men o' War were washed up. This first week of sightings appeared to coincide with hurricanes in the Atlantic making landfall in the Caribbean and Florida. There then appeared to be two further influxes after Storm Ophelia and Storm Brian. The Portuguese Man o' War is often mistaken for a jellyfish. However, it is actually a collection of different organisms which all live together and act as one, rather than a single organism. Their tentacles can give a very nasty sting, even when dead, so touching them is best avoided. Sightings were reported on the BeachStuffUK facebook page back in September and I started mapping these to see just where they were. What followed was the most amazing citizen science endeavour. Through social media, more than 300 sightings were reported to me over the 12 weeks the Portuguese Men o' War were around. These sightings have led to this, the most comprehensive mapping of PMOW we have! Thank you to everyone who let me know about sightings! If you have sightings to report, I'd be happy to add them to the map! Please send the date, the location and the approximate number of Men o' War you saw.